Kid tested, mom approved! This panko crusted chicken fingers recipe is a healthier, crunchy version of every kid’s favorite restaurant meal. Pair it with our honey dijon dip and mom and dad will be dipping away too! An easy, weeknight less than 30 minute meal! Panko crusted chicken recipes are some of my favorite. I love the crunch that Panko crumbs bring to chicken, making it the ultimate “breadcrumb”. It makes perfect chicken fingers, a delicious topping for mac and cheese, crunchy shrimp and a great filler for burgers. Panko crumbs don’t absorb much of the oil that it’s being cooked with, so that makes the coating a lot more crunchy. So, in short, you’re getting a deep fried crisp without the deep fried calories – that’s a huge win right there. Growing up, one of my favorite dinners (whether it was at home or at a restaurant) was chicken fingers. Chicken fingers with honey mustard dip (never the sweet n’ sour sauce), to be exact. Now that I’m an adult, my tastes have changed a bit. 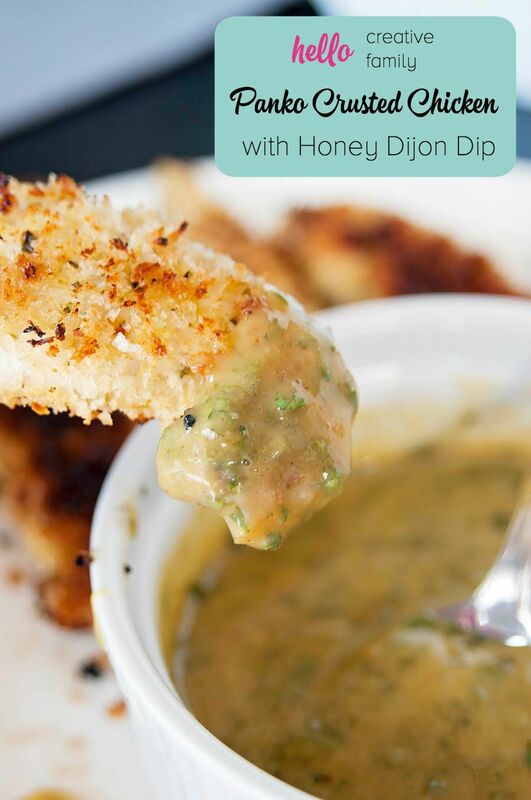 I don’t care for sweet foods when it comes to my dinner and lately I’ve been craving a spicy kick, which is why I used dijon mustard to make my “honey mustard” dip. I served this up with some steamed broccoli and with parmesan petals over top and a side salad. It went well together and inspired me for a future idea: a honey dijon vinaigrette and using the panko crusted chicken as salad toppers. If you give this a try before I do, please be sure to let me know how it worked for you and what you did. 1. In a small bowl break up an egg, add pepper and mix around. In a larger bowl add the panko crumbs, salt, and seasonings. 2. Heat the coconut oil over medium heat in a large pan. 3. Take the chicken breast fillets and dip them into the egg mixture and then coat with the panko mixture. Place in the hot pan. 4. Cook for five minutes on each side, or until fully cooked. You may have to do two batches. 5. While the chicken is cooking mix the dijon mustard, honey and parsley together. Add more honey if you want it less spicy. In a small bowl break up an egg, add pepper and mix around. In a larger bowl add the panko crumbs, salt, and seasonings. Take the chicken breast fillets and dip them into the egg mixture and then coat with the panko mixture. Place in the hot pan. Cook for five minutes on each side, or until fully cooked. You may have to do two batches. While the chicken is cooking mix the dijon mustard, honey and parsley together. Add more honey if you want it less spicy. 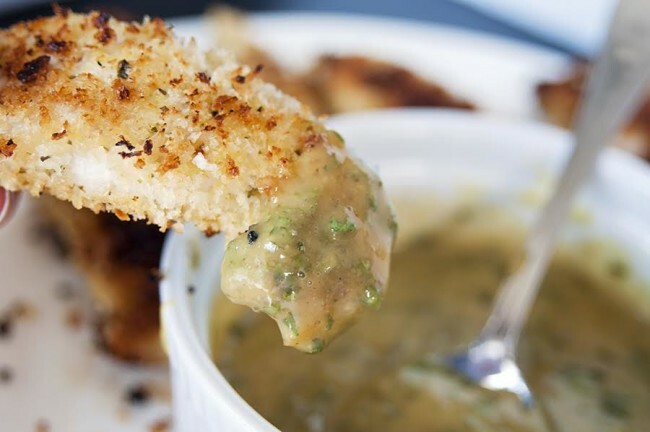 If you like this recipe for Panko Crusted Chicken w/ Honey Dijon Dip than you’re going to love the Coconut Crusted Chicken with Thai Chili Sauce over on my blog, The Bewitchin’ Kitchen. In a few weeks I’ll also be revamping the recipe but with a gluten-free twist. Tell me…Do you cook with panko? What’s your favorite way to use it? What’s your “go to” 30 minute or less meal? The dip looks delicious! I haven’t used panko crumbs before — what exactly are they? Hey Victoria. Panko is still a breadcrumb but they don’t absorb the oil (so it makes it crunchy). If I remember it correctly it’s because it’s crustless. Yum, this looks so good! My family would love it too! Thanks for the recipe! Yummy!!! This will be great for the kids after they get home from school. This sounds right up my alley! Thanks for sharing! Thank you for sharing this recipe. The kids loved it. I am now a fan and we greatly look forward to your other KIDS APPROVED recipes. These are a life-savers.